Major League Baseball Commissioner Bud Selig visited the Twin Cities Tuesday in the wake of a report calling for baseball's "haves" to give more to the "have-nots." Appearing before the Twins-sponsored group Minnesotans for Major League Baseball, Selig promised changes will be implemented to ease the disparities between rich and poor teams and to make the game more competitive. But Selig mostly repeated his familiar message that the Minnesota Twins must have a publicly-funded ballpark to survive - a message the newly-formed committee says it's not yet ready to consider. Baseball Commissioner Bud Selig talks to reporters in Minneapolis. ABOUT 150 CIVIC MOVERS-AND-SHAKERS gathered at a Minneapolis restaurant to receive Selig's advice as they begin their delicate mission of retaining Minnesota's major league team. 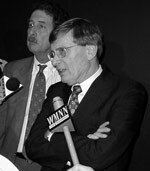 Selig touted the findings of a blue-ribbon panel, which recommended that baseball teams greatly expand their revenue sharing to make teams more evenly matched. The proposal would level the playing field for smaller market teams - such as the Twins - but must be endorsed by three-fourths of all major league teams to pass. The report also calls for the "strategic relocation" of struggling franchises. Selig told the audience some teams will be moved in the future, but only out of what he called "desperate situations." He added that he was not thinking of the Twins, but again emphasized his belief that a new stadium is required. "We're here trying to get a new stadium built and my only point is I guess because of the economic interdependence of the clubs, we have to look at things differently than we once did," Selig said. "I'm very hopeful something can be done here, I'm encouraged by everything I'm hearing, encouraged by everything I'm seeing, and I'm an optimist by nature." Businesswoman Susan Engel told Selig public and private dollars are in demand for a variety of local projects, from the Guthrie Theater's relocation to other sports facilities, and asked him for reassurances that Major League Baseball will follow through in distributing revenue more equally. Selig responded that new stadiums can also help smaller teams out of financial problems, an answer that Engel says didn't satisfy her. "We don't know for a fact how revenue sharing's going to change," said Engel. "That's an issue that we'll have to deal with that baseball can't answer for us now. So I did not find his answer as helpful for us as I'd like." But she says she supports the idea of a publicly-funded stadium, and believes Selig's point that new stadiums have been good for cities around the country. The Minnesota Twins organized Minnesotans for Major League Baseball last month, stressing the group contains a broad array of viewpoints and doesn't have to rally around the idea of a new ballpark. Twins CEO Chris Clouser, who convened the group, says Selig's blunt speech won't alter the group's thoughtful approach. "These are 154 people that are going to have their own ideas. Nobody was told what ideas to have by serving on the committee. I can tell you my personal opinion, Bud can tell you his personal opinion, I don't speak for the committee. We appointed the committee, we asked them to collectively come up with a solution, we decided with them that it's going to be a 4, 5, 6-month process." The committee plans to make recommendations this fall. "If you continue to have the Metrodome and you introduce this kind of revenue sharing, then Pohlad all of a sudden has much more in the way of resources to build his franchise, and his argument for needing subsidies to build a new ballpark becomes somewhat diminished." A separate group, working independently of the Twins, called New Ballpark Inc., is working on designs for a pared-down, privately-financed outdoor stadium. The two groups may eventually share ideas. But even as tentative new stadium plans get underway, a college professor who's written extensively on the economics of baseball, Andrew Zimbalist, says the blue-ribbon panel's report could hold a number of consequences for the Twins. The strategic-location provisions could give Twins owner Carl Pohlad more leverage in saying he'll move the team. Or Zimbalist says, the revenue sharing provisions could mean Pohlad will be expected to find his own solutions. "If you continue to have the Metrodome and you introduce this kind of revenue sharing, then Pohlad all of a sudden has much more in the way of resources to build his franchise, and his argument for needing subsidies to build a new ballpark becomes somewhat diminished," says Zimbalist. But Zimbalist says it's unlikely bigger teams - like the New York Yankees - will agree to the report's rapid stepping up of sharing dollars. He says a pared-down schedule over several years would be more palatable. And he adds Twin Cities residents have long put up a tough front to pro-stadium arguments, and will likely remain skeptical as long as any public dollars are involved.